Six Stage RO/DI Aquarium System 75 GPD Membrane 4 Stage R. Dual DI REFILLABLE Color Changing Media Cartridges. Reverse Osmosis systems, combined with A DI after filter, will give you the lowest TDS reading for your aquarium water supply. DI Resin is necessary to reduce Total Dissolved Solids (TDS) to zero and is the last stage of an RO/DI unit. New cartridges are placed into the polishing position and the remaining cartridge is put into the roughing position. Our 6 Stage Reverse Osmosis filter consists of the following. All of our sediment filters use multi-gradient spun polypropylene filter cartridges. These cartridges use the entire depth of their media by trapping the largest sediment particles on the outside of the filter, then gradually stepping down the size of particles they will reject as the water moves closer to the core of the filter. The result is longer filter life, greater dirt-holding capacity, higher flow rates, and remarkably low pressure drop. The 100% pure polypropylene media is highly resistant to bacteria and chemicals, making this an excellent choice for both well water and municipal water treatment applications. Carbon is a substance that has a long history of being used to absorb impurities and is perhaps the most powerful absorbent known to man. One pound of carbon contains a surface area of roughly 125 acres and can absorb literally thousands of different chemicals. Activated carbon which has a slight electro-positive charge added to it, making it even more attractive to chemicals and impurities. As the water passes over the positively charged carbon surface, the negative ions of the of the contaminants are drawn to the surface of the carbon granules. With carbon block filters, water is forced through the pores of the densely compacted carbon block, where a combination of mechanical filtration, electrokinetic adsorption, and physical/ chemical adsorption take place to reduce a wide range of contaminants. Solid Carbon Block technology can reduce chlorine, taste and odor problems, particulate matter, and a wide range of contaminants of health concern -- cysts (cryptosporidium and giardia), VOCs (pesticides, herbicides, and chemicals), certain endocrine disrupters, Trihalomethanes (cancer-causing disinfection by-products), heavy metals (lead, mercury), turbidity, MTBE, Chloramines and asbestos. Solid carbon block filters do not remove healthful, naturally-occurring minerals. Sodium Sulfate Calcium Potassium Nitrate Iron Zinc Mercury Selenium Phosphate Lead Arsenic Magnesium Nickel Fluoride Manganese. 85 - 94% 96 - 98% 94 - 98% 85 - 95% 60 - 75% 94 98% 95 98% 95 98% 94 96% 96 98% 95 98% 92 96% 94 98% 96 98% 85 - 92% 94 98%. % may vary based on membrane type water pressure, temperature & TDS. This part of the system is built with all the parts to make this a top notch Reverse Osmosis system. This is followed by the Dual DI Refillable Cartridges , with color changing media that alerts you when the media is exhausted. 1 Sediment Filter 5 Micron. 1 5 Micron Carbon Block Filter. 75 GPD Reverse Osmosis Membrane. Quick Connect John Guest Type Fittings. Mounting Bracket for Housings and Membrane. Color Coded FDA Food Grade Tubing. Two Refillable Cartridges with Color Changing Media. Please visit our store for Replacement Filters and DI Media for Refills. Personal checks may be held until cleared. We do not mark merchandise values below value or mark items as "gifts" - US and International government regulations prohibit such behavior. The item "RO/DI Reverse Osmosis Aquarium/Reef System Dual DI All Clear Manual Flush 75 GPD" is in sale since Saturday, June 1, 2013. 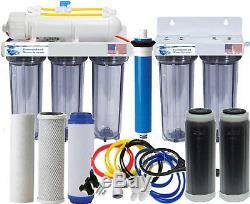 This item is in the category "Pet Supplies\Fish & Aquariums\Reverse Osmosis & Deionization". The seller is "fountainheadwatersystems" and is located in Austin, Texas. This item can be shipped to United States, Canada, United Kingdom, Denmark, Romania, Slovakia, Bulgaria, Czech republic, Finland, Hungary, Latvia, Lithuania, Malta, Estonia, Australia, Greece, Portugal, Cyprus, Slovenia, Japan, China, Sweden, South Korea, Indonesia, Taiwan, South africa, Thailand, Belgium, France, Hong Kong, Ireland, Netherlands, Poland, Spain, Italy, Germany, Austria, Bahamas, Israel, Mexico, New Zealand, Philippines, Singapore, Switzerland, Norway, Saudi arabia, Ukraine, United arab emirates, Qatar, Kuwait, Bahrain, Croatia, Malaysia, Brazil, Chile, Colombia, Costa rica, Dominican republic, Panama, Trinidad and tobago, Guatemala, El salvador, Honduras, Jamaica, Viet nam.